Members of the Archbishop’s Circle of Hope and Good Samaritan Society make a significant impact on the programs of Catholic Community Services and Catholic Housing Services of Western Washington and the people we serve. Your leadership and financial support provide the foundation for services in many vital areas such as providing food to the hungry, shelter for the weary, emergency assistance to families and individuals in crisis, supportive care for those working toward self-sufficiency, and a host of other critical services. 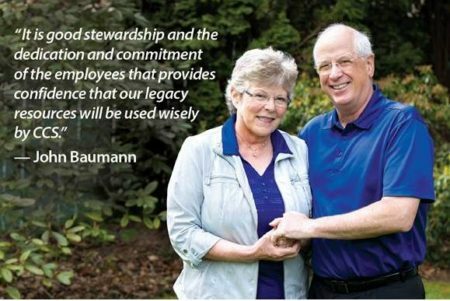 Read more of John and Marsha Baumann’s story. The Good Samaritan Society is the legacy giving group of Catholic Community Services and Catholic Housing Services of Western Washington. The Good Samaritan Society is made up of members who have included CCS and/or CHS in their estate plans. Please let us know if we can include you in this visionary group. Informing us of your intentions will help us better plan for the future. Please contact us at (206) 328-5707 or by e-mail for more information. Giving through your will or trust offers a way to support Catholic Community Services or Catholic Housing Services of Western Washington’s mission for generations to come while meeting your current financial needs. Informing us of your intentions will help us better plan for the future and include you as members in our Good Samaritan Society legacy giving group. Please CLICK HERE to learn more about Planned Giving, or contact us at (206) 328-5707 or by e-mail for more information. I give, devise and bequeath to Catholic Community Services of Western Washington (tax ID # 91-1585652) and/or Archdiocesan Housing Authority dba Catholic Housing Services (tax ID # 91-1099134) of Western Washington, a tax-exempt organization doing business at 100 23rd Ave S., Seattle, WA 98144, the sum of $____________ (or) _____% of my estate (or property described herein) (or) the residual amount of my estate. If you wish, you may designate a specific program or service area of CCS/CHS. Please contact the Fund Development Office at 1-800-499-5979 ext. 5707 or e-mail.